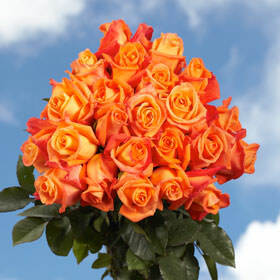 This Orange and Yellow Rose is sure to cast a spell on you and your guest, as the Voodoo Rose is enchanting with extreme exquisiteness. Having a full bowl shaped bloom and an impressive yellow bud with a dark orange lining each petal, the Voodoo is as beautiful as it is unique. Its coupled colors make it a great floret for Thanksgiving Festivities and other fall events. They also great for New Year's bashes as yellow is a symbol of friendship and good times. Valentine's Day is also very appropriate for this bud because orange's symbolism means burning love and desire. All of our products may come in varying colors and shades but we like to think of them all as green. Globalrose is dedicated to growing all of its products, including your Orange and Yellow bushels, in an environmentally safe way. Our products are of the finest in the market. Our greenhouses are the envy of the floral world because we are able to give what your florets need all year round. Located in Colombia's sunniest spots, all of our buds are drenched with sun each and every day. 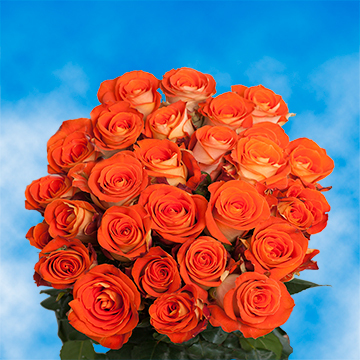 We freshly cut all of our products and your Orange and Yellow Rose bushels are no exception. When your FedEx package arrives please allow at least seventy-two hours for them to bloom.